Maile wants you to sign her petition. 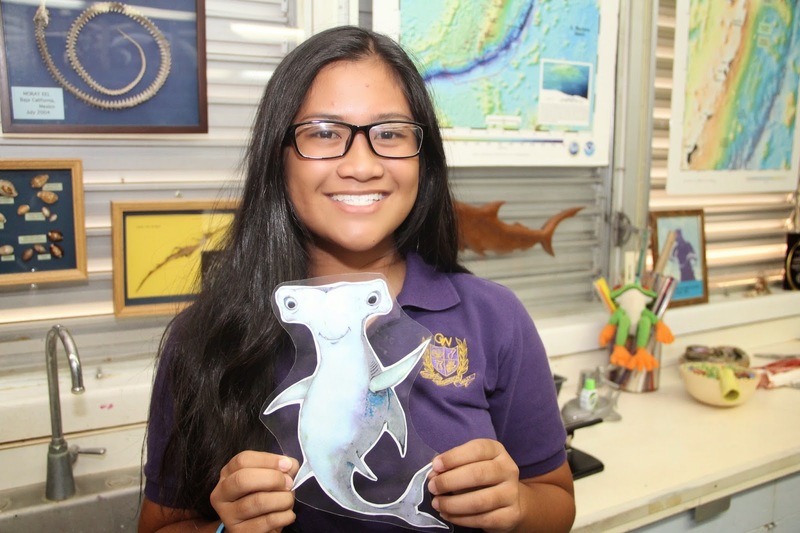 Local students from George Washington High School (GWHS) and Simon Sanchez High School (SSHS) are raising awareness of a federal attempt to overturn Guam’s shark conservation law. The National Oceanic and Atmospheric Administration (NOAA) is trying to preempt local shark conservation laws in 11 states and territories because they think the laws conflict with federal laws mandating optimum yield. The students started an online petition that calls on NOAA and US President Barack Obama to cease attempts to undermine Guam’s local conservation laws. They further ask NOAA and the president to create a shark sanctuary. The students wrote a script and filmed a video Hafa Adai, Mr. President to promote the petition. The petition started by students Maile Dolores, president of GWHS Marine Mania, and Makaelah Blas, member of SSHS Sharks MADE, has received over 2,000 signatures. The efforts of the students have attracted the attention of several international conservation organizations. The Oceanic Preservation Society, Shark Savers, WildAid, Blue Sphere Foundation, The Manta Trust, Shark Defenders, Humane Society International, and Shark Attack Survivors for Shark Conservation have promoted the protection of Guam’s shark conservation law on social networks in recent days. "Guam's shark fin law and others like it are critical to addressing the damaging ecological impacts of the shark fin trade,” said Peter Knights, executive director of WildAid. "Attempts to overturn or weaken this law, which has the strong support of Guam's citizens and lawmakers and the US Congress, will only cause more harm to sharks by increasing trade." 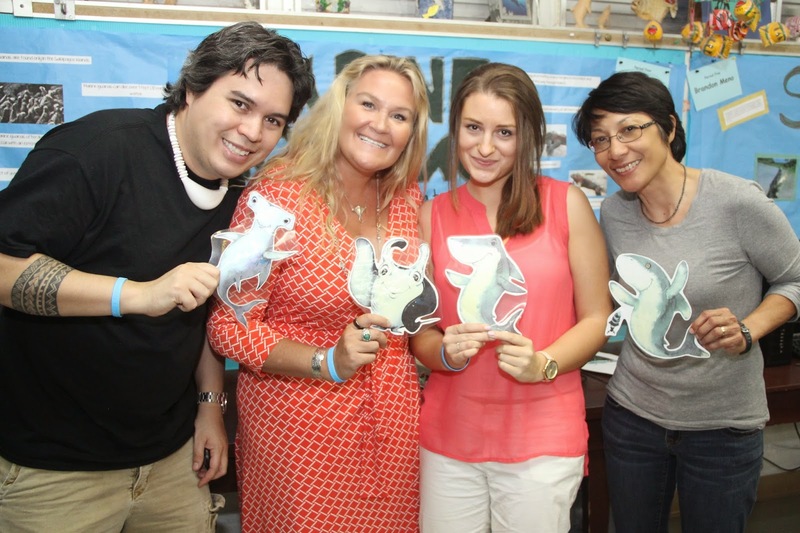 GWHS Marine Mania and SSHS Shark MADE are well known for their shark conservation advocacy. In 2011, they successfully lobbied the Guam Senate to ban the sale, trade, and possession of shark fin. Last year they called on Parties to the Convention on the International Trade in Endangered Species of Wild Fauna and Flora to protect manta rays and five species of sharks. The National Oceanic and Atmospheric Administration is trying to preempt local shark conservation laws in 11 states and territories because they think the laws conflict with federal laws mandating optimum yield. According to Guam Legislature Vice Speaker BJ Cruz, who sponsored the Guam shark law in 2011 along with Senator Rory Respicio, a federal court determined in a recent decision that optimum yield does not mean governments have to maximize fishing or the sale of fish. Cruz is thankful for the attention Guam receives for its conservation efforts. “When we’ve got kids protesting in the streets to protect sharks and the ocean, it tells the world that Guam is a green destination,” said Cruz. Cruz also explained that the federal government has already exempted California, Oregon, and Washington from preemption. “My colleagues in the Legislature are hopeful that the federal government will respect us like they did the states and let our law stand,” said Cruz. About 100 million sharks are killed each year and as a result more than half of all sharks and shark-like species are estimated to be threatened or near threatened with extinction. In recent years, starting with Palau’s creation of the world’s first shark sanctuary in 2009, governments have implemented strong measures to protect sharks. Eleven US states and territories have banned the sale, trade, and possession of shark fin, while 9 countries and overseas territories have created shark sanctuaries, collectively protecting sharks in an area about 12.6 million square kilometers, which is about the size of the United States and Mexico combined. Cardigan MP Lawrence MacAulay insists a threat to the P.E.I.tuna industry is looming with the possible arrival of long-line tuna vessels gaining access to the Gulf of St. Lawrence. The U.S. Coast Guard has rescued four Mexican citizens whose small boat began taking on water after they were caught illegally fishing near South Texas. Would it worry you to know the fish on your plate isn’t what you think it is or where you think it’s from? Considering the U.S. imports 91% of its seafood in a system that makes it easy for businesses to get away with unknowingly selling customers mislabeled fish, maybe it should. Lawmakers in state capitals and in Washington are working to see that consumers are getting what they think they are getting when buying seafood. The Florida Fish and Wildlife Conservation Commission moved forward this week with the proposed ban and several other measures to tame the lionfish invasion. In a nation where 92 percent of seafood is imported and labeling fraud is rife, both state and federal lawmakers are moving to pass laws to help make sure customers are getting the seafood they are paying for. A seafood labeling law in the South Carolina General Assembly would mean that, among other things, what is advertised as fresh local shrimp is what it says — not imported and frozen. It would make it a misdemeanor to intentionally mislabel seafood. As the four-year mark of the Gulf of Mexico oil disaster approaches, environmental groups, marine scientists and local leaders warn that its impacts — and the spectre of oil drilling off the Pinellas Beaches — may still linger. The environmental benefits of seafood traceability are obvious: By tracking a fish through the entire supply chain – from capture to plate – you can ensure the fish wasn’t caught using illegal, unreported and unregulated (IUU) fishing practices. But many companies, like Norpac Fisheries Export, are discovering that traceability is also good for their bottom lines. Six Cuban fishermen spotted in Jamaican waters near Negril in Westmoreland were yesterday processed by immigration officers and released. Wearing protective gloves and masks, members of the U.S. Coast Guard Cutter Legare carried 127 bales of cocaine -- with a street value of about $350 million -- off the ship and into a waiting trailer Tuesday. Activists say they have discovered a 6.8 tonne shark fin shipment brought into Hong Kong from the Middle East via Philippines Airlines. New York may someday get another sushi restaurant with an unusual owner: a Japanese university. A-marine Kindai Co., a company started by Kinki University in western Japan, says it hopes to open a restaurant in the Big Apple to serve farm-raised Pacific bluefin tuna, although it is more a wish than a specific plan at this point. A law change cracking down on alleged slave-like conditions on foreign fishing vessels in New Zealand waters has passed its second reading. It follows claims of physical and sexual abuse, underpayment and other appalling conditions. Sea border dispute between Vanuatu and New Caledonia has resulted in the arrest and conviction of a Chinese boat captain and members of his crew. New Caledonian maritime surveillance authorities claimed the long line vessel was fishing inside its territorial waters and slapped it with a US$5.5m fine. WHILE several of Australia's major industries are set to benefit from the recently announced free trade agreement with Japan, Port Lincoln's tuna exports are not likely to be one of them. Fiji exported FJ$5.9 million worth of fish and fisheries products to the European Union last year. The ABC's Pacific correspondent, Sean Dorney, was guest speaker recently at a Pacific Media Business Summit in Sydney. He was asked what he considered to be the big business story for the Pacific Islands. His answer surprised me. Sean Dorney told the gathering it's all about tuna. Personnel from the Maritime Affairs and Fisheries Ministry fleet under the command of the Marine Resources and Fishery Control Directorate General have arrested five Vietnamese fishing boats for illegally fishing in Natuna waters, Riau Islands. The Fisheries Department is urging fishing boat operators to register their foreign workers by the end of May. Up-to-date fishing vessel Taurus has entered service under the survey of Russian Maritime Register of Shipping (RS). The ship was built to the dual RS/DNV class and registered under the flag of the Russian Federation. The ordering customer and shipowner is ZAO TAURUS of Murmansk, RS said in its press release. Japan's Institute of Cetacean Research on Friday filed briefs in the U.S. District Court in Seattle stating its intent to resume whale hunting in the Southern Ocean as early as fiscal 2015. Billionaire Guo Guangchang, chairman of Chinese investment firm Fosun International , and three other individuals will be feted in New York this Thursday, April 17, for their efforts to stop the killing of sharks for their fins, which are a delicacy served in soup in Asia. Indonesia’s military on Sunday detained dozens of foreign nationals for fishing in waters off the coast Aceh, after arresting 56 last week for the same alleged offense. The Australian Fisheries Management Authority (AFMA) has seized four illegal boats carrying hundreds of illegally-harvested giant clams and sea cucumbers (trepang) in Northern Australia following a coordinated operation by Border Protection Command (BPC), including the Royal Australian Navy, the Department of the Environment and AFMA. The seized vessels were destroyed. Leaders of New Zealand Maori communities will be questioning how much sway they really hold in the corridors of power with one of their biggest recent victories being taken away from them. Japan said on Friday it would redesign its controversial "research" whaling mission in the Antarctic after a United Nations' court ruled it was a commercial hunt masquerading as science. The Vietnam Fisheries Surveillance Force made its debut on April 15 in the central city of Da Nang in the presence of Prime Minister Nguyen Tan Dung. Operating under the Ministry of Agriculture and Rural Development’s General Department of Fisheries, the force’s key tasks include patrolling the country’s waters, monitoring and inspecting fisheries activities as well as detecting and handling violations. A SPANISH FISHING boat has been detained by the Navy off the coast of Mizen Head for alleged breaches of fishing regulations. AUSTIN Mitchell, who has championed the cause of fishermen and the fishing industry for the past 37 years, is stepping down as MP for Grimsby. Transfer of fishing boat and vessel licences from one governorate to another is barred, the Ministry of Agriculture and Fisheries has reiterated. The ministry has published a statement in this regard in a bid to prevent instability in the fish market. Several Spanish tuna vessels operating in the Indian Ocean are in the "testing phase" to use technological equipment for replacing aboard observers. Two people were dead and three others missing Thursday after a Portuguese-flagged fishing vessel capsized 20 miles off the coast of northern Spain. The European Parliament today gave its consent to the EU’s Fisheries Partnership Agreements with Comoros, Madagascar and Seychelles. The Secretariat of Rural and Marine Affairs of Xunta de Galicia will allocate more than EUR 13.2 million in aid for permanent cessation of fishing vessels and the summons for 2014. After the proposal of the Ministry of Agriculture, Food and Environment (Magrama), the Ministers’ Council has approved the draft amendment to the State Maritime Fishing Act with the aim of promoting a number of key priorities for fisheries policy in Spain. Today, the European Parliament approved the final dossier of the comprehensive reform of the Common Fisheries Policy (CFP). A satellite tagging device a Canadian researcher attached to a Greenland shark in the Arctic in 2012 and used to record migratory data was recently found washed up on a beach 6,000 kilometres away. Iranian Coast Guard has seized seven Saudi fishing boats intruding into Iran’s territorial waters off the southern Hormozgan Province, a provincial official said. Mozambican company Empresa Moçambicana de Atum (EMATUM), set up by the government for tuna fishing, is due to start operating this year, the Fishing Minister, Victor Borges said in Sofala, cited by Mozambican newspaper O País. While patrolling in the Indian Ocean off the coast of Africa, Royal Australian Navy ship HMAS Darwin provided emergency medical assistance for a heart attack victim on a French fishing vessel. A shark catch that has possibly set a new world angling record has left a shark tourism operator furious, promising to enlist the government’s help to stop the illegal fishing of sharks. The Belgian director of Africa's oldest national park, a reserve in conflict-ridden eastern Congo, has been shot and seriously wounded but his condition is improving, park officials said. Why has the Gulf of Guinea replaced the Horn of Africa as the global center for maritime piracy? According to experts convened by the International Peace Institute, the reasons include economic deprivation, poor governance, pollution, poor natural resources management, and the ongoing crisis in the Sahel region. Artisanal fishing in Mozambique, with production of 222,000 tons of a variety of fish, accounted for 87 percent of total fishing production in 2013, Mozambican daily newspaper Notícias reported. The ocean is a big place, but not all seas are created equal. While 58% of the seas are classified as “high seas,” and open to access from all nations, there are over 150 exclusive economic zones (EEZs), which are the sole domain of the countries that operate them. EEZs comprise the remaining 42% of the ocean. The patchwork quilt of economic interests that blanket the ocean pose a problem for the fish who live there and the fisheries that exploit those fish. They’ve been flying through our skies for years. Now, unmanned drones are hitting the high seas. Bunkering in a country’s exclusive economic zone should be regulated, with the operation falling within the jurisdiction of the coastal zone, a Maltese judge declared in an international maritime tribunal ruling. We need your help! Three years ago we rallied to protect sharks in Guam’s local waters and now those protections are being threatened by federal bureaucracy. Sharks are essential for maintaining balance in the entire marine ecosystem, but these critical species are being driven to the brink of annihilation. About 100 million sharks are killed each year and more than half of all species of sharks and rays are threatened or near threatened with extinction. The global demand for shark fins is fueling their demise. To stem the decline of sharks, Guam, Hawaii, and the Northern Mariana Islands banned the trade in shark fins and prohibited the catch and possession of sharks in our waters. This effort was championed by students who rallied the global community to show their support. Now we need your help again! A proposed rule by the National Oceanic and Atmospheric Administration (NOAA) could weaken our shark protection laws. NOAA claims that the laws banning the trade of shark fins conflict with federal fishing rules. To make matters worse, NOAA is proposing a shark cull in the Marianas to “reduce shark biomass.” There is no scientifically justifiable reason for culling sharks here and in fact, every stock assessment completed in the western and central Pacific Ocean to date has shown drastic declines. Send a message to Dr. Kathryn Sullivan, NOAA Administrator and Under Secretary of Commerce for Oceans and Atmosphere, Eileen Sobeck, NOAA Assistant Administrator for Fisheries, and President Barack Obama and urge them to respect our existing, broadly-supported laws. Our people want a shark sanctuary, not a shark fishery. The Olomwaay Band let us use their song "Ow Woloo" about protecting indigenous cultures for the "Hafa Adai, Mr. President" video. Their album, Trip to Paradise is available on Amazon.com. We encourage you to purchase their album. When we started the Shark Defenders coalition in 2010, we didn't know how fun it would be. When we asked President Obama to ban shark fin in the United States, Kristen Bell, helped us out with this tweet. I have since watched Frozen six times (and will probably watch it again on today's flight from Narita to Dulles), which begs the question, "Do you want to ban some shark fins?" Kevin Bacon retweeted it, which is another thing more likely to happen than being killed by a shark. Two years ago, with some urging from the Humane Society International, Ke$ha, who now goes by Kesha, gave a shout out to the shark conservation work going on in Fiji. The Guam shark fin ban is being threatened by federal rulemaking today, but you can show your support by signing this petition created by Maile Dolores and Makaelah Blas students at George Washington High School and Simon Sanchez High School, respectively. 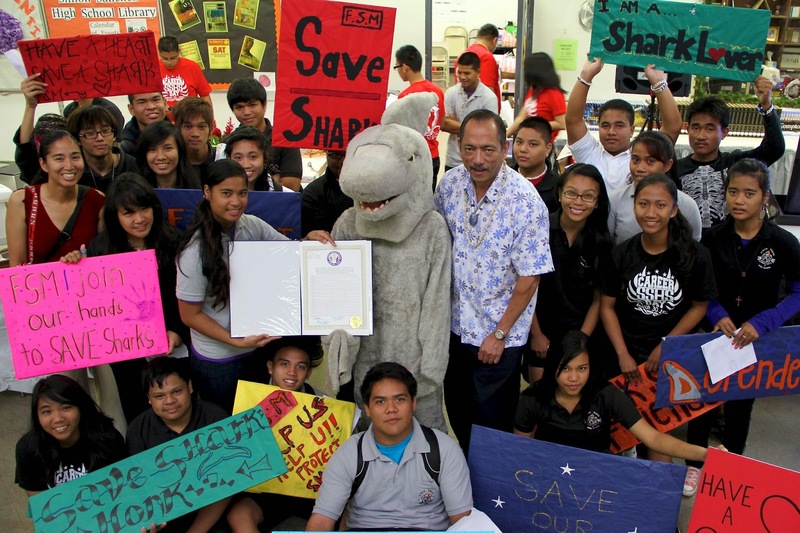 TIDE students with Shark Stanley and Friends during last year's CITES campaign. 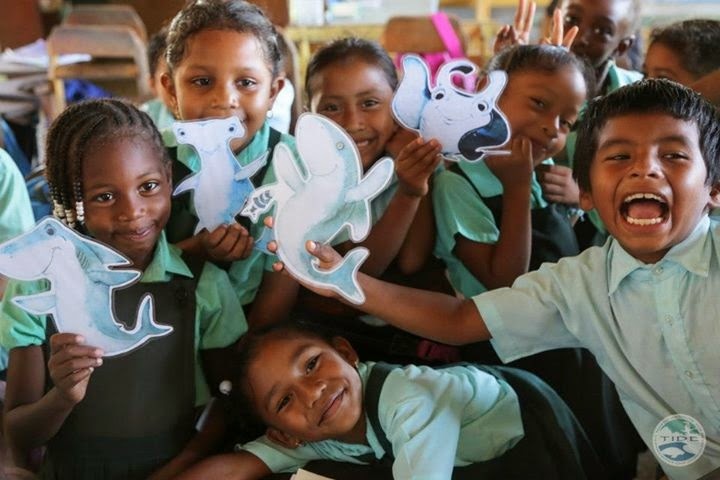 We received a message recently from our Shark Stanley partners, TIDE, down in Belize. Caroline wanted to make us aware of a new program they have this summer, and wanted to make sure people interested in gaining field experience knew about it. Last year I was really proud to support Shark Defenders and Shark Stanley on the run up to CITES. What a success story! I’ve not been lucky enough yet to see a hammerhead in the wild, but I’m looking forward to the opportunity any day now! I’m still working in Belize, where I supported the Shark Stanley campaign last year, based at a local non-profit organisation called TIDE. The work TIDE does encompasses both terrestrial and marine environments, in one of the least developed regions in Central America – it’s such a beautiful place to be! This year I’m busy developing a new volunteering opportunity for TIDE to help us with our ever expanding research and monitoring requirements. The program will give participants hands-on, authentic experiences in tropical conservation methods, encompassing all the habitats the region has to offer from lush mountain forests to the wonderfully colourful coral reefs! Ridge to Reef Expeditions is perfect for anyone wanting to gain valuable field experience, and explore one of the most exciting regions in the area. We are launching with our first team expedition this summer so things are getting really busy here at R2R camp! I’ve been busy doing promotional work, prepping the field stations and ordering our new diving equipment. Today I met with a local scientist who will help me to develop the new monitoring programs – we are all particularly excited to be starting the first large scale study of manatee populations in southern Belize! Every day is jam packed and completely different to the last, which means there’s never a dull day. Follow Ridge to Reef Expeditions' progress on our Facebook page. I’d love to hear from anyone who’s interested in getting involved! We had the chance to meet up with Julie Hartup of the Manta Trust in Guam this week. After a short dip in the ocean, she agreed to an interview for our blog. Shark Defenders: What attracted you to study mantas and where can you find them in the Micronesia region? 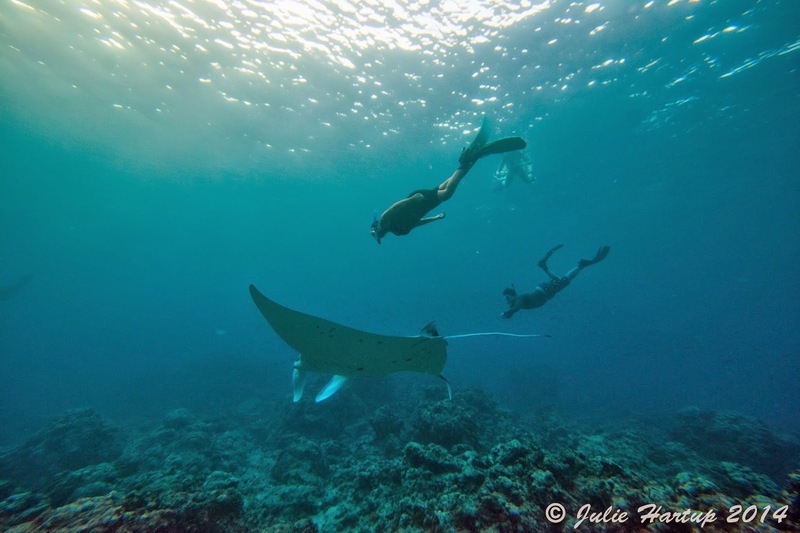 Julie: While diving in Yap I had some incredible interactions with reef mantas. At the time I was trying to decide if I wanted to return back to school to obtain my Master’s degree and what marine animal I would want to spend the rest of my life studying. I was surprised to learn that no one was studying the Yap mantas, and no one knew about any of the manta populations throughout Micronesia. I decided to start studying manta rays, right here in my own backyard, here in Guam through the Master’s Program at the University of Guam Marine Lab. We knew from snorkeler’s and divers that Guam had a population of manta rays but knew little to nothing about them. It has taken a lot of hard work but we have been learning a tremendous amount about Guam manta rays and manta rays throughout Micronesia, more then I expected. It has personally been rewarding. SD: What are you learning about the mantas in Guam? Is there something unique about them? Julie: Mantas can tell you a lot about themselves, just by looking at them. Each manta has unique spot patterns on their belly’s that enables you to tell one individual from another. The size of the manta gives you an idea if it is young or a more mature individual. Presence or lack of reproduction appendages tells you if it’s male or female. Scars can tell you if the mantas are mating or what natural or anthropogenic pressures they might be experiencing. For instance, in Mozambique mantas have more shark bites, Maui mantas have higher number of missing cephalic lobs (those paddle like appendages coming off the side of their mouth region) from getting tangled in long fishing gear. Guam mantas have cuts and slashes in them, most likely from boats and wave runners. To date we have found a unique in behavior in our Guam mantas. I had heard of two different times in 2010 people had seen mantas feeding where fish were spawning. It was thought the mantas were feeding off the fish spawn since mantas eat zooplankton. I figured that if mantas were targeting these events to feed, I would need to find out where and when these spawning events were taking place. The idea was that the spawning aggregation of fish would lead me to the mantas. In 2012 I had two predicted spawning dates I had transposed from the 2010 dates and moon phases, a site, two species of fish thought to spawn, and two different daylight times. I was hoping the mantas would show up. Sure enough on my first predicted event, my snorkeling partner Paul Carlson and I went over the reef where we actually had two species of fish spawning (one of those species was unexpected), hundreds if not thousands of fish and 12 mantas were feeding off the fish spawn. Several months later we had the second predicted event of a different fish species, and sure enough we had a huge aggregation of fish spawning and again at least 12 manta feeding. It was the biggest thrill I’ve ever had. I just couldn’t believe my hypothesis, theory, and methods all worked. It had been documented that whale sharks, a relative of manta rays, targets fish spawning aggregations to feed, but this was the first every documented event of manta rays targeting fish spawn as a food source. Our Guam mantas created scientific history, it shows how important studying new things in new areas matters, adding to the overall scientific understanding from other regions. I have been learning so much about mantas and fish spawning aggregations at these events. SD: The manta rays you are seeing in Guam are just outside the marine protected area in Tumon, which up until the reserve was created a few years ago was full of jet skis, banana boats, and dinner cruises. Do you know if the creation of the protected area is responsible for the appearance of the mantas? Julie: It would be great to have previously collected data, or information prior to when the MPA was established but unfortunately we didn't. What came first, the fish spawning, mantas, or the MPA? I would love to answer that question. I’m assuming we can’t prove this, but I know the MPA has had a huge positive effect on the number of spawning fish. If the MPA were not there, those fish numbers would be dramatically lower, if not completely gone. Fishing at fish spawning aggregations is an easy way to get a high volume of fish with the least amount of time expended, however this can radically increase the potential to overfish a population if not regulated. It’s no secret Guam has been overfished, and if the MPA weren’t there, I believe all the fish and healthy corals starting to thrive there would not be there as well. We would mostly have intermittent live and dead coral, limited fish, low diversity, and algae, which isn’t too attractive to tourists. By creating the MPA the fish population was able to naturally increase. More fish in a spawning aggregation make more noise and emit natural chemicals into the water probably attracting the mantas. Additionally, manta rays are shy creatures. Loud noises from boats, or waver runner traffic are not a draw for manta rays. Local residents have noticed that in another area where mantas regularly were sighted in the past have decreased. This area, over the years has had increased boat and wave runner action. I wonder if we limited boat and waver runner activity in certain areas if the mantas would return to those habitats? We could have areas where tourists and locals could enjoy wave running and habitat areas unobstructed for the manta rays. Wouldn’t it be great to build up sites where mantas rays are frequenting? We could have a potential of creating areas tourist and locals could see these magnificent animals without chasing them off. Manta rays currently bring in $140 million dollars worldwide annually for ecotourism. If we were able to do this in a correct and controlled manner, as not to affect the mantas or other interest groups, it’s a win-win for everyone. By creating the MPA and limiting the boat and wave runner activity it allowed an area for manta rays and fish to naturally flourish. Just like in society we need different roles for a thriving community. We need MPAs or Community Based Managed Area for us to have healthy reefs and “good” fishing. I’m a believer in sustainable management. However, there are some fish or marine animals due to their life history that cannot and should not be fished. Manta rays and sharks can’t support sustainable fishing. Living on an island, fish is a major proponent of the communities diet, social interactions, businesses, and cultural history. I just want to make sure all these things can be around for the next generation. SD: Some of the places you work, including Palau, Yap, and Guam, have legislation protecting manta rays. What is the reason behind doing that? Julie: Manta rays, just like thier relatives the sharks live long, mature late, and have a limited number of offspring. Mantas are thought to live at least live 50 years and maybe even on up to 100 years. However, we only have documentation of mantas living 30 years since we just started studying them in the last several decades. Marine animals that have life histories such as manta rays need protection. Luckily our Island of Guam and several other Micronesian islands know how important they are and have protected manta rays along with sharks. Yap and Palau have seen the benefits of manta ray ecotourism making them even more important to these regions to protect. These animals are magical. I’ve spent hours diving next to these creatures and every time I come away in awe of their beauty. I’m very concerned about the recent proposed Shark fishing in the Mariana Archipelago. Our Guam law would be dissolved leaving Guam sharks and manta rays unprotected. These magnificent animals could be fished out for their gill rakers ending up in a Chinese medicine store or as a supplement ingredient for shark fin soup. We would never know if Guam could have actually set up dive ecotours around our manta population.